That consolidated clinical testing (core) labs could significantly benefit healthcare providers and patients is becoming accepted wisdom. But how many administrators know how to plan one? In the August issue of Health Facilities Management, Flad's Jim Gazvoda and Jeff Raasch offer a primer on planning a well-designed, efficient, cost-effective core lab, focusing on the Flad-designed Mayo Clinic Clinical Diagnostic Testing Laboratory and twin labs for Northwell Health that are scheduled to open in 2018. The authors make the case for an early determination of the number of tests a heathcare system and the number and types of tests it hopes to perform in the future, rather than allowing the project’s intended budget to drive determinations of square footage, which would affect how much equipment can be accommodated and, thus, how many tests of various types could be performed. Fleshing out the lab floor requires thoughtful analysis of a host of complexities, with each consideration best viewed through the lens of reducing the cost per test — and ensuring accurate results are returned to patients in hours rather than days. By all accounts, hospital systems around the country are studying the core lab model as a way to hold down costs of testing emanating from their own systems, but also as a means to open an important revenue stream. 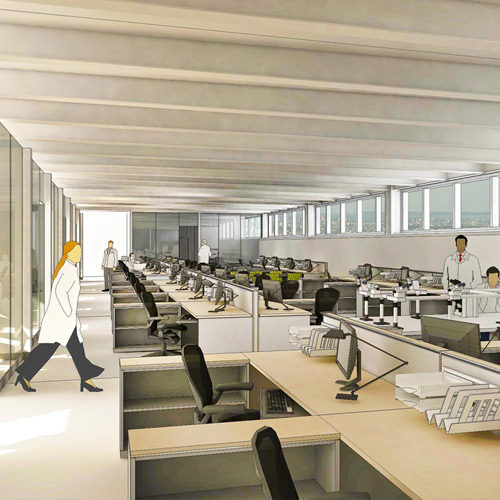 New York City Health + Hospitals' agreement with Northwell to create its forthcoming mega core lab (as the Clinical Laboratory of New York Alliance) is being counted on to save tens of millions of dollars annually.